Just a week before the 4th anniversary an overal technical update was done which also added the possibility to subscribe to the Metalpics.ch newsletter. You can find it at this page directly under the Pic of the Month. The newsletter will be sent out once or twice per month and will contain the updates and the news of the current period. 02-05-2006 - Prelude to the festival season!!! It's just a few weeks before the best time of the year starts. This year a lot of festivals revealed a great line-up which made it very hard to take a choice. We tried to make it a good mixture choosing some of our "regular" festivals as well as a few new ones. Here's our choice and our best recommendation for the summer 2006. To find out more about the festivals, click on the name and check out the official website. Hope to see you on some of them too!!! RockHard Festival, 02.-04. June: Started as a jubilee celebration, the event at the impressive amphitheater turned into an annual festival. This year the RockHard crew is presenting over 20 bands, such as Celtic Frost, Dio, Nevermore, Edguy and Bolt Thrower. Tuska Festival, 30. June - 02. July: The open air in the heart of Helsinki is presenting a high class line-up and exciting after show parties around the center of Finland's metropolis. This year the Tuska Festival is presenting over 30 bands, such as Venom, Celtic Frost, Opeth, Anathema and Arch Enemy. Metalcamp, 21.-23. July: The festival is taking place in a little paradise in the slowenian Alps at one of the most beautiful rivers of Europe, know for its unique turquoise colour, the Soca. The Metalcamp team presents over 60 bands, such as Dimmu Borgir, Satyricon, Hypocrisy, Testament and Kataklysm. Party.San, 10.-12. August: The 3-days-festival known for its good atmosphere offers an international line up and great parties for the fans of cozy open airs. The Party.San crew presents 26 bands, such as Cryptopsy, Marduk, Six Feet Under, Hypocrisy and Kaamos. Summer Breeze, 17.-19. 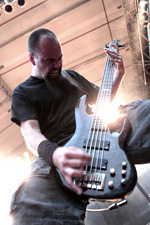 August: For the 5th time allready Metalpics.ch is recommending the festival in the south of Germany. A good atmosphere, tasty beer and a lot of sun are taking place at a new area. We're very excited to see it, as well as 50 bands, such as Fear Factory, Amorphis, My Dying Bride, Finntroll and Unleashed. Up From The Ground, 25.-26. August: A closure of the festival season absolutely worth looking forward to. "From the fans, for the fans" the team is presenting great value for money and over 20 bands, such as Obituary, Morbid Angel, Suffocation, Dismember and Sinister. April 14th at Spielboden, Dornbirn (Austria). Now, you can check out the pics of the first date featuring Cannibal Corpse, Kataklysm, Legion Of The Damned, Grimfist and Psycroptic by either choosing the band or the venue in the "gallery". The pics of the other three dates are following soon. Special thanks to Maurice, Legion Of The Damned, Kataklysm, Psycroptic and the Metallysee crew for making the trip possible and for the absolutely great time! This year's Metal Therapy Festival, set to take place on April 15th in Amneville, France is presenting 15 bands including Moonspell, Mayhem, Hypocrisy, Soilwork and Amorphis. Check out the Metal Therapy Festival website for more information. On the cover of their latest issue, Nr 1 (6) February 2006, Pure Metal magazine from Poland is featuring Metalpics.ch with Exodus at the Z7, Switzerland. Check it out at a store nearby or at http://www.metal.net.pl/pure.php. Many thanks to Vlad for the cooperation! Also don't miss Dismember's great new album "The God That Never Was" featuring Metalpics.ch inside the booklet. You guys rule!! !